Saleh Muhammad Suleiman al-Arouri (Imemc.org, July 20, 2014). 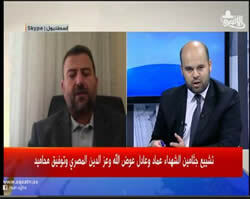 Saleh al-Arouri interviewed from Istanbul by Al-Aqsa TV during the funeral for the remains of Hamas operatives Adel and Imad Awadallah (Al-Aqsa TV, May 6, 2014). Saleh al-Arouri gives a speech at a meeting in support of Sheikh Ra'ed Saleh in Damascus (YouTube, August 13, 2014). 1. Saleh Muhammad Suleiman al-Arouri is a senior Hamas operative based in Turkey. On August 20 2014, he told the participants of the fourth conference of the World Union of Islamic Sages (held in Turkey) that Hamas' military-terrorist wing was behind the abduction and murder of the three Jewish youths in Gush Etzion (June 12, 2014). He read his speech, saying that he was speaking on behalf of Hamas leader Khaled Mashaal (calling him the "head of this resistance"). He was apparently recorded without his knowledge and his speech was uploaded to YouTube and received much feedback. 2. In his speech he claimed that "the struggle of the masses has grown to include all the occupied lands. It reached a height in the heroic action carried out by the [Izz al-Din] al-Qassam Brigades, which captured three settlers in Hebron." He claimed the abduction and murder were committed to support the hunger strike of the Palestinian detainees in Israeli prisons. 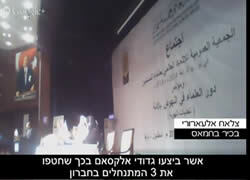 According to the speech, the abduction and murder a part of Hamas' campaign to ignite a new intifada throughout all of Palestine (including Israeli Arabs, "the Arabs of 1948"). Click https://www.youtube.com/watch?v=h1_eJjZCdZ4 for the video. 3. It was the first time a senior Hamas figure admitted publicly (although the remarks were made in a closed forum) that Hamas' military-terrorist wing was behind the abduction and murder of the Israeli youths, setting in motion the events that led to Operation Protective Edge. Until now, while Hamas publicly supported the attack, its spokesmen were careful not to formally claim responsibility. Senior Hamas figures and Hamas spokesmen went so far as to claim Israel was spreading false accusations and repeatedly claimed the affair was "an Israeli invention" (Facebook page of Sami Abu Zuhri and Al-Aqsa TV, June 30, 2014). 4. 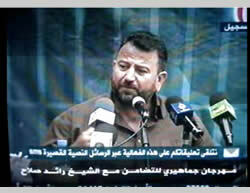 In ITIC assessment, the large amount of media feedback generated by al-Arouri's speech annoyed Hamas. Khaled Mashaal, the head of Hamas' political bureau, admitted in a follow-up interview that Hamas operatives were in fact responsible for the abduction of the three Israeli youths, although he claimed that the Hamas leadership had no prior knowledge of it and only found out about it following the Israeli investigation. He added that the leadership understood the Palestinians were frustrated by the "hostility and the occupation," and therefore took any action possible (Yahoo, August 23, 2014). 5. Saleh al-Arouri then fell in line with Khaled Mashaal, claiming that his speech had not been intended as a claim of Hamas responsibility for the abduction or killing of the three youths. He claimed that he had been referring to a group of Hamas operatives who carried out the abduction against Israel, as revealed by the Israeli investigations. He claimed the Hamas leadership had no prior knowledge of the group of abductors and only found out later that they belonged to Hamas (Hamas.info, August 23, 2014). 6. Saleh al-Arouri was born in the village of Aroura (in the Ramallah district) in 1966, is a member of Hamas' political bureau and held the prisoners' affairs portfolio. In the 1990s he was one of the founders of the Hamas' military-terrorist wing in Judea and Samaria. He was detained by Israel in 1992 and sentenced to five years in prison for membership in a terrorist organization. Since then he has served various prison sentences. He was released on March 30, 2010 and expelled from Israel. He went to Jordan and from there to Syria. In Syria he was appointed to Hamas' political bureau and given the prisoners' affairs portfolio. He was a member of the Hamas negotiating team in the Gilad Shalit prisoner exchange deal. 7. 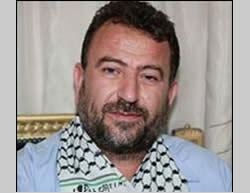 Saleh al-Arouri recently moved to Turkey, which provides Hamas with political, propaganda and economic support. In Turkey he enjoys freedom of action, which he uses to handle Hamas military-terrorist infrastructure in Judea and Samaria (Shabak.gov.il August 19, 2014). As part of Hamas' anti-Israeli incitement campaign, al-Arouri repeatedly calls on the residents of Judea and Samaria to carry out terrorist activities against Israel by beginning a third intifada. 8. Released from prison in Israel and having moved to Syria, Saleh al-Arouri resumed his terrorist activities. Arriving in Syria, he was appointed to Hamas' political bureau and received the prisoners' affairs portfolio. He was involved in the Gilad Shalit deal. At the same time, as responsible for Judea and Samaria in Hamas' external headquarters, he continued to establish, fund and strengthen the Hamas military-terrorist infrastructure in Judea and Samaria. During the past two years his name has been mentioned in connection with the handling of Hamas terrorist networks in Judea and Samaria. Examples follow. 9. Between May and August 2014, the Israeli security forces detained several dozen Hamas operatives in Judea, Samaria and Jerusalemsuspected of involvement in establishing a military-terrorist infrastructure to carry out terrorist attacks in Israel. According to the Israel Security Agency (ISA) the infrastructure, which was directed by a Hamas headquarters in Turkey, recruited operatives and acquired weapons and may also have planned to overthrow the Palestinian Authority (PA). 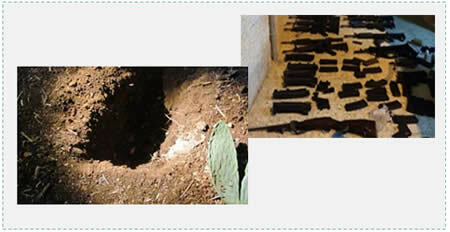 When the network was exposed large quantities of weapons, ammunition and money were discovered. The network was headed by Riyad Nasser, from Deir Qaddis (in the Ramallah district), who had previously been imprisoned in Israel (Shabak.gov.il August 19, 2014). 10. The ISA investigation revealed that Riyad Nasser was recruited by Saleh al-Arouri, who was expelled from Israel and currently resides in Turkey. Before his expulsion he charged Riyad Nasser with constructing an extensive Hamas network in Judea and Samaria to undermine local stability and instigate a third intifada. To that end a number of local squads were formed which were directly handled by Riyad Nasser. Squads were formed in Nablus, Bethlehem, the Yatir region, Jerusalem and Tulkarm. Experts in engineering and chemistry were also recruited. According to the ISA, one of the network's objectives was to overthrow the PA, but apparently the plan was still in hits first stages (Shabak.gov.il August 19, 2014). Left: One of the locations where weapons were hidden. Right: Some of the weapons found in the squad's possession (Shabak.gov.il August 18, 2014). 11. Saleh al-Arouri denied involvement in directing a terrorist network. In response to the detention of 94 Palestinians suspected of membership in the Hamas network, he claimed the information was "false" and meant to "whitewash the failure of Israeli intelligence." He claimed "the weapon of the resistance" [i.e., terrorism] targeted only Israel and that the detainees were "resistance fighters." He also claimed that there was no network in Judea and Samaria with 94 operatives, because Hamas squads acted separately and in small groups (Al-Aqsa TV, August 19, 2014). 12. At the beginning of 2013 two Hamas operatives were detained. They had tried to smuggle funds into Judea and Samaria via the Allenby Bridge. They were found to be carrying €10,000 and $900 hidden in cigarette cartons. During interrogation they revealed that they were supposed to receive additional funds for Saleh al-Arouri (Shabak.gov.il April, 2014). The money was to be used to finance Hamas' terrorist activities in Judea and Samaria. 13. According to reports in the Israeli media at the end of 2013, Hamas rebuilt its military-terrorist headquarters in Judea and Samaria. It was directed by a group of terrorist operatives who served long prison sentences in Israel for killing Israelis. They were released in the Gilad Shalit deal and expelled to the Gaza Strip, and led by Saleh al-Arouri. He is supported by a group of operatives in the Gaza Strip, who regularly transmit instructions and sums of money for the Judea and Samaria squads (Amos Harel in Haaretz, December 20, 2013). 14. On May 5, 2014, a rally was held in Istanbul in support of the hunger-striking administrative detainees in Israel. Among those present were Husam Badran, an external spokesman for Hamas, and Saleh al-Arouri, who were Hamas' representatives at the rally (Al-Aqsa TV, May 10, 2014). 15. Interviewed by Al-Quds Al-Arabi, he claimed he expected the outbreak of an armed popular intifada against Israel in Judea and Samaria. He claimed the "resistance" in Judea and Samaria were constantly gaining power, which would eventually lead to an overall confrontation with Israel. He also expressed hope that the "resistance" in Judea and Samaria would be able to acquire rockets. Asked if that were possible, he claimed that rockets could be manufactured in the Gaza Strip, which was under siege, and that in Judea and Samaria it would also be possible to overcome the difficulties and manufacture rockets. He also claimed that in a new war against Israel there would be "surprises" and that every future round of confrontation would be different from the previous one because Hamas did not stop developing its capabilities (Alquds.co.uk, May 4, 2014). 16. On May 6, 2014, Saleh al-Arouri was interviewed from Istanbul during the funeral held for the remains of Hamas operatives Adel and Imad Awadallah, which were returned by Israel to the Palestinians. He praised the Awadallah brothers and stressed the concept of "resistance" [i.e., terrorism] against Israel (Al-Aqsa TV, May 6, 2014). He claimed [the day of the funeral] was an important day in the history of jihad and the struggle in Judea and Samaria, stressing that "the option of resistance" had not disappeared: it was currently to be found in sleeper cells and the underground, the result of external pressures, but it would arise at the first opportunity. He claimed the Palestinians had no way of extricating themselves from the [so-called Israeli] "occupation" except for jihad, which resulted in casualties. He also claimed that the Palestinians were at a crossroads, because their attempts to restore their rights through negotiations, UN agencies and international organizations had reached a dead end (Al-Aqsa TV, April 30, 2014). 17. During an interview at the end of 2013, asked about Hamas' situation in Judea and Samaria, Saleh al-Arouri said that the "resistance" was Hamas' raison d'être. He claimed that Hamas in the Gaza Strip was always in one of two situations: either preparing for battle against Israel or waging a battle, and those were the only two activities Hamas engaged in. He claimed that in Judea and Samaria two main actors had joined forces against Hamas, the PA's security forces and Israel. Hamas had made great efforts to renew the "resistance" but the PA was an obstacle (Al-Intilaqa, December 16, 2013). The Awadallah brothers were among the founders of Hamas' military-terrorist wing in Judea and Samaria. They were killed on September 10, 1998, in an exchange of fire with IDF forces near Tarqumia (near Hebron). Their remains were returned to the Palestinians on April 29, 2014, according to an agreement following an Israeli Supreme Court decision. On April 30, 2014, Hamas held a mass funeral for the two, which turned into a show of force for Hamas in Judea and Samaria. It was made possible by the agreement between Hamas and Fatah for a national consensus government.